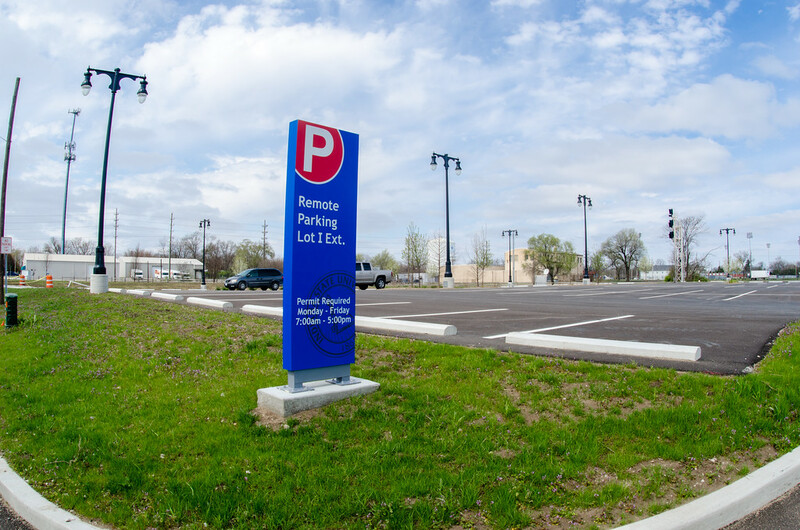 The key to happiness at Indiana State University was unlocked by Michael Williamson, assistant professor of civil engineering, and students in his transportation course who conducted a parking study to locate the most abundant parking on campus during peak, weekday hours. "Over the past several years, I have heard many complaints from students and faculty about the parking shortage (on campus)," Williamson said. "I'm also on several university and college-level committees, and Parking Services has been coming to a lot of those because they've had a lot of complaints recently about parking on campus." After listening to Lori Elkins, assistant director of parking services, and Police Chief Joseph Newport speak to the Faculty Economics Benefits Committee, Williamson decided his focus area in transportation could be of help. He contacted Elkins and Newport and proposed that students in his transportation engineering course conduct a parking study to see how many parking spaces are available campus-wide and how many spaces are occupied in each lot - a job that could have cost thousands of dollars to hire an engineering firm to tackle. "I was aware of some of the things that the students researched, like which lots are full during the day, etc. The information that surprised me was the times of the day that the lots actually fill up," Elkins said. "This information is very useful to students who come in later in the day for classes. Based off of the information gathered, a student can look on the graphs and determine which lots will have open spaces during the time period they come on campus. We look forward to partnering with Professor Williamson and his classes in the future to continue gaining information concerning parking on campus." Last spring, the course's nearly dozen juniors and seniors broke into four groups to examine the campus lots - nine student-staff, seven faculty and staff, six student, four remote and the parking garage. Each group drove or walked every lot each hour between 7:30 a.m. and 3:30 p.m. Tuesday through Thursday and divided the parking garage counts into two-hour blocks with each group participating in order to count the spaces - 5,689 spaces total. The unmanned systems program also flew drones over the lots and captured aerial images to aid in the count. "Companies hire engineers to do this same kind of study, so having that experience in college is a benefit," said Michael Giocolo, a senior civil engineering technology major from Joliet, Ill. The study concluded that drivers can always find a parking spot on campus, just not maybe in the lot of their choice. "The southwest part of campus is pretty well filled up," Williamson said. "There's a lot of parking by the tech building that is filled up most of the day, and there are student lots across from that but there is housing near there and the lots stay full most of the time. The lots on the north and east side have more availability, though." Williamson used the data to construct bar graphs showing capacity in each campus lot versus the occupied spaces each hour. Because there were no issues with handicapped and service vehicles space availability, only data for regular parking spaces were graphed. The graphs will be available on the Parking Services website. "I presented this to the students as a project that they could put on their résumés to show that they have actually done an engineering study," Williamson said. "This is a typical first, entry-level engineering project and it is real life, not something out of a textbook or something we made up. That's career readiness right there." Photo: https://photos.smugmug.com/Other/Media-Services/Media-Miscellaneous/Remote-Lot-I/i-bbKx73W/0/6bb8cab9/XL/Remote%20Parking%20Lot%20I_Gibbons-1739-XL.jpg - Photo of Remote Parking Lot I Extension on Indiana State University's campus. Michael Williamson, assistant professor of civil engineering, and students in his transportation course conducted a parking study to locate the most abundant parking on campus during peak, weekday hours.